1. A person who pays rent to occupy, to hold, or to use land, a building, etc. 2. To hold as a tenant; to occupy. Descriptive of someone who is trembling with panic or anxiety: Joan, trepidant and shaking all over, was waiting in the hospital while her husband was undergoing a very serious surgery. 1. Militant to an extreme. 2. Someone who is extremely militant. Descriptive of something that is fluctuating, vibrating, or wavy. 1. Having no contents; empty; void: "The trunk in the basement was vacant." 2. Having no occupant or tenant; unoccupied: "There were several vacant seats on the train." "By the end of the game, the stadium was almost vacant." "William, do you know of a vacant apartment in this neighborhood?" 3. Devoid of thought or reflection: "Henry had a vacant mind after he heard the politician ranting and raving." 4. Characterized by, showing, or proceeding from lack of thought or intelligence: "Fay has a vacant expression on her face." "People gave vacant stares at the guys who were arguing with each other on the side of the street." 5. Not occupied by an incumbent, official, or the like. 6. Free from work, business, activity, etc. : "Jack and Jane have a few vacant hours before the next project is started." "Since retiring, Marie's father has had a lot of vacant time on his hands." 7. Devoid or destitute (often followed by of): "Hank was vacant of human sympathy for the beggar." 8. Having no tenant and devoid of furniture, fixtures, etc. : "It was a vacant house." 1. Having or exhibiting valor; courageous. 2. Characterized by or performed with valor. 1. Covered with green vegetation or foliage. 3. Lacking experience or sophistication (inexperienced or unsophisticated); such as, a verdant youth. 4. 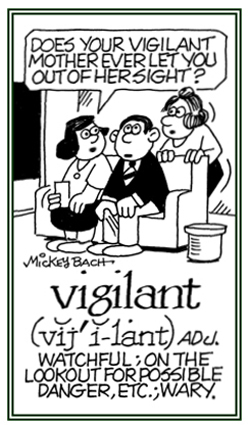 Noun form, verdancy; adverb form, verdantly. 1. To be attentive and alert, especially to guard against danger, difficulties, or errors: Tourists were warned to be extra vigilant when traveling in the city; particularly at night. 2. Being careful and noticing problems or signs of unacceptable behavior: The vigilant employees of the store were always watching for customers who might commit thievery. © ALL rights are reserved. 1. A visitor or a guest who goes to see another person or place for a short time. 2. Someone who sees someone or something. 3. A supernatural being; a ghost or specter that is seen by someone or group of people. 4. Anyone who goes or comes to see another person and who is a guest in the house of a friend. 1. Relating to an animal or something engaging in flight or is capable of flying: Most birds, and even many insects, are volant creatures which have wings and move easily through the air. 2. Descriptive of a movement which is quick or nimble and is agile: Ted's volant cat was very fast while it was capturing a mouse that ran across the living room in his house. 3. 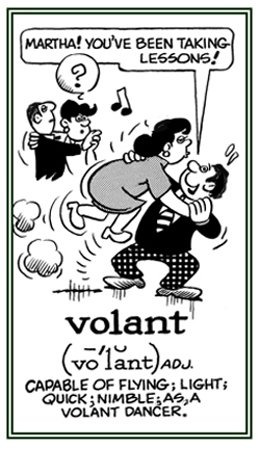 Etymology: from Latin volare, "to fly". © ALL rights are reserved. Showing page 11 out of 11 pages of 164 main-word entries or main-word-entry groups.